Reminiscent of the Karnak Pendulum, which was made of sandstone and found in a sarcophagus in the Valley of the Kings in Egypt, the geometric form of our gemstone Egyptian pendulums accounts for their very high dowsing sensitivity. This particular shape constantly emits energy, thereby supposedly cleaning itself of any energy 'absorbed' from its environment whilst also having the benefit of minimal energy loss by the user. Equally good for the beginner or advanced user. Quartz has six principle properties. It can structure, store, amplify, focus, transmit and transform energy on every level, and it is the only truly ‘programmable’ crystal known to man. 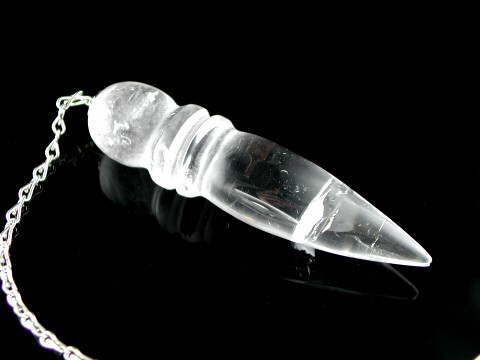 This means that you can get a piece of Clear Quartz to ‘take on’ the attributes of virtually any other crystal. The clearer the piece, the more masculine (Yang) energy it has. This type also tends to have stronger, faster acting energy. The milkier specimens are more feminine (Yin) in energy and are better suited to long-term or chronic conditions. Clear Quartz is superb for cleansing, activating and charging all Chakras, and can be used to draw out pain from the physical body - it is a crystal healing essential. Comes with a free, satin, drawstring pouch.